The primary objective of Stephen Harper’s absurdly-named Fair Elections Act is to prevent hundreds-of-thousands of Canadians from voting for the NDP, Liberals, Greens, etc. The Conservatives are, in effect, “cheating” the electoral process again, just as blatantly as in the past. They know that a large number of people – students, marginalized people and First Nations – will have a hard time voting because of the changes. And they know those people would not likely vote Conservative. Even though the Conservatives are trailing in the polls, it’s much too soon to say they will lose the election. Harper’s gang of strategists and pollsters have masterminded their way to victory three times, overcoming tough odds each time. But efforts to help people to register to vote are not as strong as they could be. There needs to be close co-operation among groups to make sure that as many people as possible – particularly people in some 70 ridings where the Conservatives are vulnerable – have the identification they need to vote. working to defeat the Conservatives. The Council of Canadians contends that some 770,000 people may have a difficult time voting because of the changes to the Act. Included are 400,000 people who used the voter ID card in 2011 and believe that’s all they need this time; 250,000 people who will move during the election period; and 120,000 who used vouching in 2011. If many of those 770,000 people are unable to vote, the Conservatives could win a crucial number of closely contested seats. Vote splitting among New Democrats, Liberal and Greens – similar to what occurred in 2011 – could also result in another Harper government. A second factor could prevent many people from voting. Voting was less complicated when Elections Canada enumerators went door-to-door registering voters and explaining where to vote, a process that was eliminated in 1997. Now voter information is compiled from tax records, which are less reliable. “ It's all part of voter suppression, making it as complicated as possible so people will just throw up their hands and stay home,” says Stephanie Sydiaha, a Saskatoon activist working on registering voters. Public interest organizations are responding to the challenge, hoping to play a leading role in defeating the Conservatives. 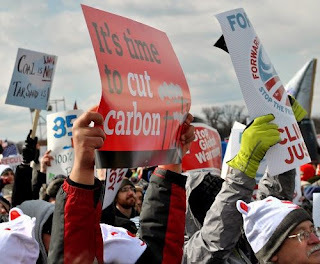 Dozens of groups want to “knock off” the Conservatives, including well-staffed NGOs, the Council of Canadians, Leadnow, and Dogwood Initiative; unions UNIFOR, the Public Service Alliance of Canada , the Professional Institute of Public Servants of Canada, the Quebec Federation of Labour and others; First Nations groups in many ridings; and avaaz, the international lobby group. Some groups are urging people to vote strategically for either the NDP or Liberals in as many as 70 ridings, while others are campaigning for just the NDP. So far, only a few groups are running campaigns that encourage people to vote. The Council of Canadians and Leadnow’s ‘Vote Together’ are the main groups encouraging people to vote. Their campaigns are quite similar. People who visit their websites are asked to pledge that they will vote. So far, the response has been limited. Both groups are giving extra attention to young voters. The Council has hired high-profile activist Brigette DePape to run its campaign. The Council and Leadnow are conducting door-to-door campaigns, talking with people and leaving information on what they need to do to vote. The Council has been working in 10 ridings and Leadnow 13. Both groups say they plan to conduct detailed work in more ridings. Because the Act makes it more difficult for people to vote, groups should do more than just drop off literature and a voters’ guide. Interestingly, one small group is doing a more thorough job. In Saskatoon’s downtown generally low-income core, a group of about 15 volunteers have been trained to take people – many of whom have never voted before – through the entire process to get ready to cast their ballot. The volunteers, equipped with laptop computers, printers and cell phones, go to locations in the city where people congregate. They show people the Elections Canada website and, if they’re not registered, they help them through the process. They make sure people have the right pieces of identification to make sure they will not be turned away at the polls. This kinds of hands-on facilitation should be used by other groups in many neighbourhoods. Some 14-million-plus people are expected to want to vote. It’s difficult to say how many will not make it through Harper’s rabbit snare of a voting process. But if a million are stymied, it will have a significant impact on the outcome of the election. I dread thinking of a situation where, two or three days before the election, the NDP is leading the Conservatives by, say, three points in opinion polls. But come the morning after the election, and Harper ends up with perhaps three more seats than the NDP because of his latest trickery. There is still time – and a serious need – for more groups, particularly unions, to get involved in voter registration campaigning. Groups involved in the registration campaign need to co-ordinate their efforts. The Canada Elections Act restricts groups (Third Parties) from colluding to provide more than the legal amount of advertising revenue in support of a candidate, but there’s nothing in the Act preventing groups from working together to help people to vote. Even at this late date, the creation of a national co-ordinating committee could give the campaign the profile needed to warm people about the changes to the Act. There’s still time to publicize the issue and conduct fundraising through a series of national newspaper ads. There’s plenty of work for individuals. 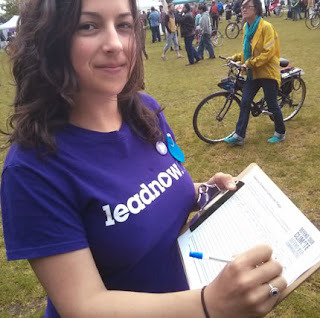 People can contact the Council of Canadians, Leadnow’s Vote Together or their union and volunteer to help with door-to-door voter registration. Or, if you’d rather work in your neighbourhood on your own, that’s great too. Post voter information in community centres, churches, and grocery stores. Voting guidelines and, if you want to, you can vote now. If the campaign works, it will be one of the main reasons why Canadians will wake up on October 20th to a new government. Very good model in Saskatoon. Good idea to spread it nationally. I thought the Canadian Fedn of Students had a campaign aimed at students - maybe they're cooperating with the Council of Canadians' Go Vote campaign, but it isn't prominent on the CFS website. You're correct. The CFS and the CoC have been cooperating on getting students to vote. Their campaign includes Rock the Vote and a very useful guide, "Be the Game-Changer No One Saw Coming—Voter's Guide 2015". Are you registered to vote on October 19th? Does vote swapping interest you? I was not sure of getting a legit loan lender online But when i could not face my Debt any more, my son was on hospital bed for surgery that involve huge money and i also needed some money to refinance and get a good home then i have to seeks for Assistance from friends and when there was no hope any more i decide to go online to seek a loan and i find VICTORIA LAWSON Trust Loan Firm (marianlawson@outlook.com) with 2% interest Rate and applied immediately with my details as directed. Within seven Days of my application She wired my loan amount with No hidden charges and i could not take care of my son medical bills, Renew my rent bill and pay off my debt. I will advice every loan seeker to contact VICTORIA LAWSON Trust Company with marianlawson@outlook.com For easy and safe transaction.